A family-owned pizzeria in New Jersey is facing backlash after an officer claimed she got a pizza box with the word “pig” written on it. In early August, the East Brunswick police officer walked into the family-owned pizza restaurant to pick up her order. While the officer waited for her food, pizzeria owner Frank Mancini’s brother marked a pizza box with a sharpie and put it in the oven to wait for pickup, NJ Advance Media reported. Mancini, though, denies there was any anti-cop message. 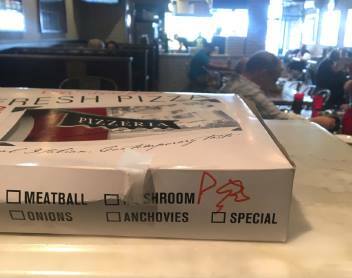 Mancini states that the box in question was titled with “P” for plain pie and had a symbol next to it to indicate garlic twist. The restaurant maintains that this is a case of misunderstanding and that it appreciates and supports the police force. "This has been a nightmare," Mancini said. "We love cops. People just want to blow it up for our business to fail." In an attempt to defend itself, Mancini Pizza released a photo, claiming it showed the pizza box in question. However, the police union denied the photo was accurate. The East Brunswick community has responded to the allegations by calling for a boycott of the restaurant. Its Yelp page is now being monitored because of reviews left regarding this incident.